While American Idol still draws impressive ratings, they aren’t nearly as impressive as they once were. Will new judges help turn the ratings slide around? Could the show actually be in danger of being cancelled this year? That seems unlikely but you never know. Stay tuned! Ryan Seacrest returns as host and Randy Jackson is joined by three new judges; Keith Urban, Mariah Carey, and Nicki Minaj. 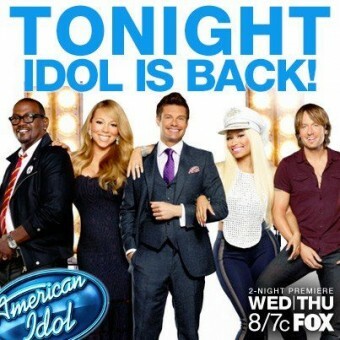 The 12th season of American Idol typically airs twice a week on FOX; on Wednesday and Thursday nights. Below are the TV show’s latest Wednesday ratings for the 2012-13 season, the best way to tell if American Idol is going to be cancelled or renewed for season 13. 3.0 in the demo (+3% change) with 12.11 million (+8% change). Season averages: 3.87 in the demo with 13.27 million. 2.9 in the demo (0% change) with 11.11 million (-1% change). Season averages: 3.92 in the demo with 13.33 million. 2.9 in the demo (-12% change) with 11.26 million (-11% change). Season averages: 3.98 in the demo with 13.46 million. 3.3 in the demo (-3% change) with 12.46 million (-2% change). Season averages: 4.05 in the demo with 13.60 million. 3.4 in the demo (+6% change) with 12.71 million (+4% change). Season averages: 4.10 in the demo with 13.68 million. 3.2 in the demo (+3% change) with 12.23 million (+4% change). Season averages: 4.15 in the demo with 13.74 million. 3.1 in the demo (-3% change) with 11.76 million (-5% change). Season averages: 4.22 in the demo with 13.86 million. 3.2 in the demo (-11% change) with 12.33 million (-5% change). Season averages: 4.32 in the demo with 14.04 million. 3.6 in the demo (-5% change) with 12.94 million (-4% change). Season averages: 4.42 in the demo with 14.19 million. 3.8 in the demo (0% change) with 13.44 million (+5% change). Season averages: 4.50 in the demo with 14.32 million. 3.8 in the demo (+9% change) with 12.84 million (+9% change). Season averages: 4.58 in the demo with 14.41 million. 3.5 in the demo (-10% change) with 11.72 million (-14% change). Season averages: 4.67 in the demo with 14.61 million. 3.9 in the demo (-5% change) with 13.30 million (-8% change). Season averages: 4.84 in the demo with 15.02 million. 4.1 in the demo (-5% change) with 14.37 million (+6% change). Season averages: 5.00 in the demo with 15.31 million. 4.3 in the demo (-7% change) with 13.45 million (-6% change). Season averages: 5.18 in the demo with 15.50 million. 4.6 in the demo (-16% change) with 14.27 million (-11% change). Season averages: 5.40 in the demo with 16.01 million. 5.5 in the demo (0% change) with 15.78 million (-2% change). Season averages: 5.67 in the demo with 16.59 million. 5.5 in the demo (-8% change) with 16.07 million (-12% change). Season averages: 5.75 in the demo with 17.00 million. 6.0 rating in the 18-49 demographic with 17.93 million total viewers. Season averages: 6.00 in the demo with 17.93 million. American Idol had an impressive start to the season but, once again, was down significantly year-to-year. Season 11 debuted with a 7.4 rating in the 18-49 demographic with 21.93 million total viewers. Reference point: The first weekly editions of the 2011-12 season (typically Wednesdays) averaged a 5.3 rating with 17.66 million viewers. You can see the week-by-week breakdown. What do you think? Do you still like the American Idol TV series? Do you think it should be cancelled or renewed for a 13th season? American Idol was going downhill even before Nicki Minaj was one of the judges. Get rid of Nikki, miss attitude, always rolling her eyes. She has such a sour face and really can’t sing her self. It ends to end, before the ratings could get worse. Fox has great potential, but it can’t fully experience due to a dying reality tv show. It takes up 3 hours that could be used for new shows. This year in pilot season 4 dramas look like they have potential (human, boomerang, sleepy hollow and delirium) as well as 4 sitcoms. It’s a shame that hours are being wasted. But I do want American Idol to return for another season. If it gets cancelled, I wouldn’t know how to spend my nights on Wednesdays and Thursdays! How about going out and spending time with friends? Just keep Keith and Randy and GET RID of Nicki and Mariah!!!!!!! I really don’t like both of them, but if Mariah stayed, I wouldn’t mind. As long as Nicki gets her big @$# off of the judging panel!!!!!! I agree with Lora, get rid of the women and keep the boys. All Mariah does is sit there and play with her hair and looks bored out of her mind…darling (barf) And Niki OMG that voice, it’s like nails on a chalkboard…and she just goes on and on..me me me me me..and this not getting what she wants and walking off…let her go ! Please! Whoever hired her should be fired…she has done nothing for that show, but make it a joke now! This show is not number one anymore, cancel it already, It’s gotten old and stale, do not ruin the reputation it’s just gonna get worse ratings if they keep going on. Won’t even watch again until Nikki is removed from the show!!!! NO CLASS WOMAN! It is NOT the kind of drama I care to sit through. Not very thrilled with Marian either!! Keep Keith & replace the women. 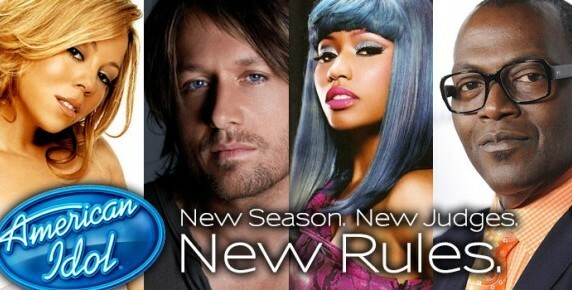 Get rid of Nicki and the show will be much better. I don’t enjoy hearing her open her mouth. She has ruined it for me!!! Why do you have to compare AI from a year ago? Compare it to the other programs in the same time slot at present. That is more important than comparing the ratings of the same program from a year ago. American Idol is still the strongest program without compare, number one this year, last year, the year before last, and on and on and on…. And look at the second place after AI in any year , the ratings of AI are always almost double the second place.